This delicious meal plan by Christine Gerbstadt, MD, RD, will help you get your diet on track without feeling hungry or deprived. Combine this healthy eating plan with the rest of the 28-Day Transformation Challenge to uncover your healthiest body ever! Whisk 1 Tbsp olive oil and 2 tsp balsamic vinegar in bowl. Add 2 cups mixed field greens; ½ cucumber, thinly sliced; 3 oz deli-sliced low-fat turkey breast; 3 tomato slices (½” thick); 1 rib celery, sliced; 5 baby carrots; and 10 unsalted pecan halves. Toss well. 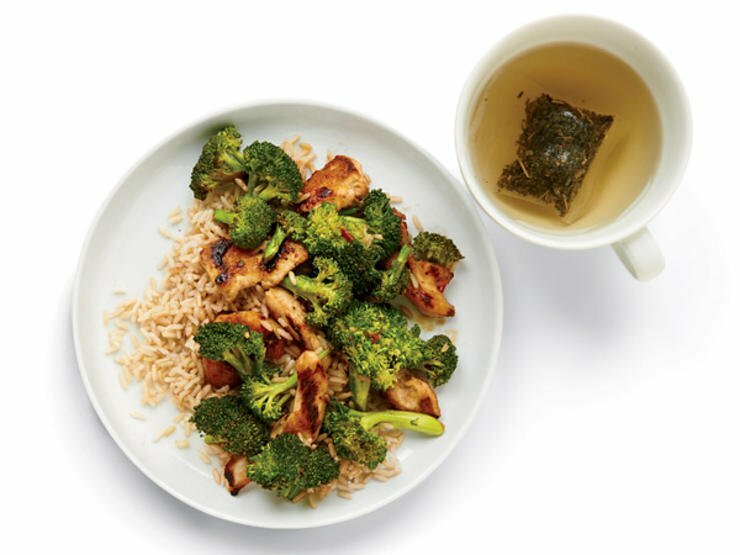 Cook 3 oz sliced boneless, skinless chicken breast and 1 cup small broccoli florets (frozen or fresh) in 1 Tbsp olive oil in skillet over medium-high heat, stirring, until chicken is done and broccoli is crisp-tender. Stir in 1 tsp chili sauce and ¼ tsp reduced-sodium soy sauce. Serve over ½ cup cooked brown rice. Heat 2 cups low-sodium veggie broth, ½ cup cooked soba (buckwheat) noodles, 3 oz diced cooked chicken, 1 Tbsp thinly sliced green onions, and ½ tsp minced garlic in saucepan over medium heat. Heat 1 Tbsp olive oil in skillet over medium-high heat. Add 3 oz filet mignon or lean beef cut into chunks and cook with 1 cup sliced mushrooms and ¼ cup each diced onion and red bell pepper. Serve over ½ cup cooked quinoa. Combine ½ frozen banana, 4 oz fat-free milk, 1 oz unflavored whey protein, 1 Tbsp ground flax meal, and 2-4 ice cubes in blender. Puree until smooth. Drain 3 oz solid white tuna packed in water and mix with 2 Tbsp diced celery and 1 Tbsp reduced-fat mayonnaise. Spoon on 1 slice whole wheat toast and top with 3 tomato slices (½” thick). Top ½ cup cooked whole wheat spaghetti with 3 oz broiled boneless, skinless chicken breast. Spoon ¼ cup marinara sauce evenly over chicken and pasta. Top with 1 Tbsp grated Parmesan or Romano. Serve with 8 spears steamed asparagus drizzled with 1 Tbsp fresh lemon juice. Sauté 2 Tbsp each diced red bell pepper and onion in skillet coated with cooking spray over medium-high heat until tender. Add 2 lightly beaten eggs and cook, stirring, until cooked through. Divide among 2 warm corn tortillas and top evenly with ½ oz shredded Jack cheese. Mix together 1 cup fresh cabbage-and-carrot cole slaw mix, 2 Tbsp 0% plain Greek-style yogurt, and 1 tsp cider vinegar. Put 3 oz deli-sliced low-fat turkey breast on large (13.5” diameter) whole wheat tortilla. Top with slaw and roll up. Top 5 oz 0% plain Greek-style yogurt with ¼ cup low-fat granola and ½ cup each strawberries and blueberries. Sprinkle with 2 Tbsp each sliced almonds and ground flaxseed. Whisk together 1 tsp olive oil, ½ tsp balsamic vinegar, and 1 tsp chopped fresh basil for Basil Vinaigrette. Toss with 2 cups mixed salad greens, 3 oz sliced grilled chicken, 5 baby carrots, and 5 tomato wedges. Sprinkle with 1 oz shredded Jack cheese. Broil 3 oz tuna steak. Whisk together 1 Tbsp minced fresh ginger, 1 Tbsp rice vinegar, 1 Tbsp sesame oil, and ¼ tsp reduced-sodium soy sauce. Top tuna with dressing. Prepare 5” frozen or homemade pancake and top with ¼ cup raspberries and 2 Tbsp 0% plain Greek-style yogurt. Sauté 1 cup each sliced portobello mushroom and zucchini, 1 Tbsp diced onion, and 1 clove chopped garlic in skillet coated with cooking spray over medium heat until tender. Put on large (13.5” diameter) whole grain tortilla, top with 4 fresh basil leaves and ½ oz crumbled feta, and roll up. Coat 3 oz beef tenderloin with ½ tsp cracked black pepper and broil until desired doneness. Spread 1 oz reduced-fat cream cheese on ½ whole wheat bagel. Top with 1 oz smoked salmon, and 2 slices each tomato and cucumber. Whisk together 1 tsp olive oil, 1 tsp chopped fresh dill, and ½ tsp red wine vinegar and drizzle over top. Combine ½ cup rinsed and drained low-sodium canned pinto or navy beans, 1 Tbsp diced onion, 5 diced baby carrots, 1 cup low-sodium vegetable broth in saucepan and heat through. Fill whole wheat wrap (8” diameter) with 3 oz deli-sliced low-fat turkey breast; ¼ cup shredded carrot; 2 Tbsp diced red bell pepper; ½ cucumber, cut into in strips; and 2 Tbsp 0% plain Greek-style yogurt mixed with 1 tsp curry powder. Brush 3 oz shrimp with 1 Tbsp olive oil and grill until cooked through. Toss together ½ cup cooked brown rice mixed with 2 Tbsp rinsed and drained low-sodium canned black beans and ¼ tsp Cajun seasoning. Toss 3 oz drained canned tuna (chunk light in water) with 2 cups romaine lettuce, 1 sliced cooked beet (2”), 1 cup steamed fresh or frozen green beans, and 3 black olives. Drizzle with 1 Tbsp olive oil with 1 tsp red wine vinegar. Alternately thread 5 cherry tomatoes; 1 small onion, quartered; 3 oz boneless, skinless chicken breast, cut into chunks; and 3 mushrooms onto metal skewer. Coat with cooking spray and grill until vegetables are tender and chicken is cooked through. Serve over ½ cup cooked quinoa. Toss 1 cup torn romaine lettuce with ¼ avocado, sliced. Drizzle with 1 tsp olive oil and ¼ tsp balsamic vinegar. Sauté 3 oz chicken breast in 1 tsp olive oil in skillet with 2 cups shredded cabbage and 2 Tbsp fresh lemon juice. Add ¼ cup low-sodium, fat-free chicken broth. Serve over ½ cup cooked whole grain pasta. Sauté 2 Tbsp each diced red bell pepper and onion in skillet coated with cooking spray over medium-high until tender. Add 2 lightly beaten eggs and cook, stirring, until cooked through. Divide among 2 warm corn tortillas and top evenly with ½ oz shredded Jack cheese. Gently toss together 2 cups baby spinach, ½ sliced cucumber, 1 sliced hard-boiled egg, 1 oz crumbled feta, and 3 black olives. Drizzle with 1½ tsp Basil Vinaigrette. Coat 3 oz salmon with cooking spray and broil/grill until cooked through. Serve with 2 small boiled red potatoes and 8 cooked asparagus spears. Sprinkle with 1 tsp chopped fresh parsley and 1 Tbsp fresh lemon juice. Top whole grain wrap (8” diameter) with 3 sliced mushrooms, ½ cup green bell pepper strips, ½ sliced tomato, and 1 oz grated part-skim mozzarella. Broil until cheese melts. Top with ¼ sliced avocado. Serve 3 oz broiled filet mignon with 1 small baked potato topped with 1 Tbsp 0% plain Greek-style yogurt and 1 tsp chopped fresh chives. Sauté 1 cup brussels sprouts in 1 Tbsp olive oil with 1 clove minced garlic. Simmer 3 oz diced boneless, skinless chicken breast in 2 cups low sodium fat-free chicken broth with 5 sliced baby carrots, 1 rib sliced celery, and 1 Tbsp chopped fresh parsley in saucepan until chicken is cooked through and vegetables are tender. Toss 1 cup mixed salad greens with ½ diced tomato and 1½ tsp Basil Vinaigrette. Alternately thread 4 oz extra firm tofu cubes; 1 med zucchini, cut into chunks; 1 medium bell pepper, cut into chunks; and 5 mushrooms onto metal skewers. Serve with ½ cup cooked whole barley. Combine 1 cup cooked lentils, 1 cup low-sodium, fat-free chicken broth, ¼ cup chopped carrots, and 2 Tbsp chopped celery in saucepan and heat through. Stir-fry 3 oz peeled and deveined shrimp in 2 tsp canola oil with 2 cups frozen Asian vegetables until shrimp is cooked through and vegetables are crisp-tender. Stir in 1 tsp each reduced-sodium soy sauce and dark sesame oil. Put 3 oz low-fat deli-sliced turkey breast on large whole grain wrap (13.5” diameter). Top with ½ cup shredded cabbage, 1 Tbsp dried sweetened cranberries, and 1 Tbsp low-fat Italian dressing. Broil 3 oz crabmeat cake and serve on a small whole wheat roll with a leaf of romaine lettuce and 3 red bell pepper slices. Drizzle with the juice of ¼ lemon. Serve 3 oz grilled beef tenderloin steak with ½ cup each sliced onions, bell pepper, and mushrooms sautéed in 2 tsp olive oil with 1 clove minced garlic. Serve 3 oz grilled chicken breast on whole wheat roll with 2 leaves romaine lettuce and 2 slices tomato. Top with 1 Tbsp low-fat Ranch dressing. Cook 3 oz turkey breast cutlet with 4 baby carrots and ½ cup peas in ½ cup fat-free, low sodium chicken broth in broiler-safe skillet until turkey is cooked through and vegetables are tender. Toss with ½ cup cooked whole wheat linguine. Top with ¼ cup seasoned bread crumbs and broil until golden. Prepare 1 soy-vegetable patty per package directions. Serve on 1 slice whole wheat toast with 1 tsp Dijon mustard, 2 leaves romaine lettuce, and 3 slices (¼”) cucumber. Brown 3 oz lean ground beef and stir into ½ cup marinara sauce. Layer meat sauce with 2 cooked whole wheat lasagna noodles and ¼ cup low-fat cottage cheese in small baking dish. Top with 1 Tbsp grated Parmesan. Bake until bubbling. Broil 4 oz turkey burger until cooked through and serve between 2 slices whole wheat toast with 2 slices unsweetened pineapple and 2 large leaves lettuce. Toss 3 oz sliced grilled chicken breast with ½ cup cooked whole wheat spaghetti and ¼ cup dry Marsala in skillet and heat through. Dice 3 oz broiled chicken breast and serve on top of 2 cups mixed salad greens with ¼ cup each chopped mushrooms, cucumber, and bell pepper. Sprinkle with 1 tsp unsalted sunflower seeds and drizzle with 1 Tbsp low-fat Italian dressing. Serve 3 oz baked sea bass drizzled with 2 Tbsp balsamic vinegar. Serve 3 oz broiled ground beef patty on 6” corn tortilla (baked until crisp) and top with ½ cup shredded lettuce, 2 Tbsp diced tomato, and 2 Tbsp salsa. Brush 3 oz chicken breast with 1 tsp olive oil and grill until cooked through. Dice and sprinkle on large (13.5” diameter) toasted whole wheat wrap with and ½ cup sliced onion and mushrooms. Sprinkle with 1 Tbsp grated Parmesan and broil until cheese melts. Sauté 3 large peeled and deveined shrimp and 2 sea scallops in 1 Tbsp olive oil with 1 clove minced garlic and 1 Tbsp diced onion in skillet until just cooked through. Add ½ cup low-sodium vegetable broth, ½ cup diced tomato, and 2 Tbsp fresh lemon juice and heat through. Combine 2 cups water, 4 oz cubed firm tofu, 1 cup chopped bok choy, ½ cup sliced mushrooms, ½ cup cooked soba (buckwheat) noodles, 2 sliced scallions, and 2 Tbsp miso paste in medium saucepan. Stir to combine. Bring to a boil and cook 5 minutes. Sauté 3 oz boneless, skinless chicken breast in 1 Tbsp olive oil with 1 clove minced garlic, ½ cup diced tomatoes, 2 Tbsp sliced onion, and 4 black olives in skillet until cooked through. Arrange 3 oz sliced grilled chicken breast on 8” whole wheat tortilla. Top with ½ oz shredded low-fat Cheddar, 1 Tbsp barbecue sauce, 1 Tbsp chopped onion, and ½ cup shredded iceberg lettuce. Sear 3 oz tuna in skillet coated with cooking spray until desired doneness (or used drained canned tuna). Add ½ cup cooked whole wheat penne, 1 cup peas, 4 chopped basil leaves, and 1/8 tsp pepper. Remove from heat and stir in 2 Tbsp 0% plain Greek-style yogurt. Rinse, drain, and mash ½ cup canned low-sodium black beans. Spread onto 2 6” corn tortillas (baked until crisp). Top evenly with 1 oz shredded Jack cheese and broil until cheese melts. Top evenly with ½ cup shredded lettuce and 2 Tbsp salsa. Sauté 1 cup diced (fresh or frozen) cauliflower, 1 small diced red potato, ½ cup green beans, 1 clove minced garlic, and 1 Tbsp curry powder in 1 Tbsp olive oil in broiler-safe skillet until tender. Top with ¼ cup whole wheat panko bread crumbs and broil until browned. Serve 3 oz cooked lean ground beef patty on whole wheat roll topped with 1 tsp Dijon mustard; ¼ avocado, sliced; 1 outer leaf romaine lettuce; and 2 slices tomato. Cut 3 oz beef tenderloin into cubes. Stir-fry in 1 Tbsp olive oil with 1 clove chopped garlic and ¼ cup sliced onion in skillet. Add 1 cup broccoli florets (fresh or frozen). Whisk together ½ cup low-sodium beef broth, 1 tsp reduced-sodium soy sauce, and 1 tsp cornstarch. Add to skillet and cook on high, stirring, 1 minute. Mix 3 oz diced cooked turkey breast with 2 Tbsp diced celery and 1 Tbsp reduced-fat mayonnaise. Spread between 2 slices whole wheat toast topped with 2 leaves romaine lettuce and 4 slices tomato. Sauté 4 slices (1” thick; 5” diameter) peeled eggplant in 1 Tbsp olive oil in skillet until softened. Layer in small baking dish with ½ cup marinara sauce and 2 oz shredded part-skim mozzarella. Bake until bubbly and cheese melts.